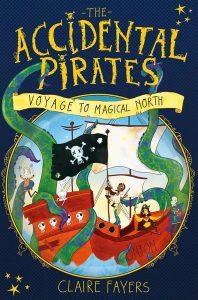 Take to the high seas in Voyage to Magical North, a swashbuckling pirate adventure filled with magic by Claire Fayers. Twelve-year-old Brine Seaborne is a girl with a past . . . if only she could remember what it is. Found alone in a rowboat as a child, clutching a shard of the rare starshell needed for spell-casting, she’s spent every day since housekeeping for an irritable magician and his obnoxious apprentice, Peter. But everything changes when Brine and Peter accidentally break the magician’s starshell and need to flee the island. Lost at sea, they blunder into the path of the legendary pirate ship the Onion. Before you can say ‘pieces of eight,’ they’re up to their necks in the pirates’ quest to find Magical North, a place so shrouded in secrets and myth that most people don’t even think it exists. If Brine is lucky, she may find out who her parents are and why they sent her out to sea. And if she’s unlucky, everyone on the ship will be eaten by sea monsters. First of all, it’s delightfully funny. How could you resist a giggle at the exploits of the legendary pirate ship The Onion ? I couldn’t. Such a brilliant combination: pirates and magic! But there’s a lot more to Voyage to Magical North than just fun and adventure. There’s a good deal about courage and trust for a start off. Who do you rely on, and where do you find your own bravery? Quotations from books such as Aldebaran Boswell’s Book of Scientific Knowledge or delightfully cheeky ballads head each of the 37 short, event-filled chapters. Pleasingly, the relationship between stories and truth is part of the book too. Claire Fayers finishes this Accidental Pirates tale with a satisfying ending but leaves you itching to know what their next exploits will be. Happily, there are more adventures with The Accidental Pirates in Journey to Dragon Island. Interesting how both Brine and Peter’s allegiances and sense of self change. This entry was posted in Review and tagged #writersreviews, Claire Fayers, Macmillan Children's Books, MG by KMLockwood. Bookmark the permalink.